A relaxing week down the coast and time to hang out with family. A time to catch upon some knitting and grow some projects. The two that came with me are Dr G’s memory vest, which I am doing in Madelinetosh 80/10/10 worsted in a great colour called rainwater. 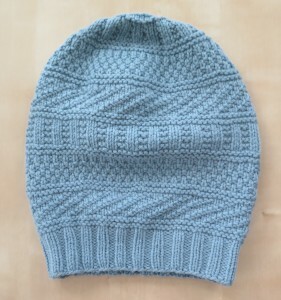 The cable pattern is great and easy to get into, I am up to the armholes, I have knitted it in the round to avoid seaming, and also going it grows quicker. This is the first cable knitting I have done in the round and have to say really like how it is doing out. The yarn is so soft and seems to give great stitch definition. 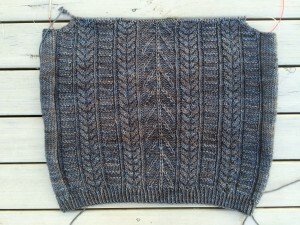 I think my gauge is off a bit so will have to see how well it blocks but with all the cables there will be stretch. As with all cabling it seems to take a lot longer than I expected but I like the outcome. 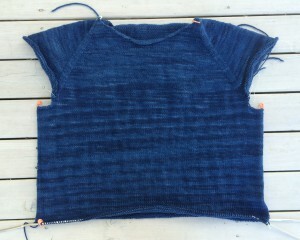 The knitting that has had the most attention is the top down sweater in the indigo Swan’s Island worsted, I am almost down to the waistband, about 2″ to go before the ribbing. The dying of the hanks are interesting and they are all the same batch number. I have knitted a couple of smaller things like beanies and I find the extremes in the dying tend to wash out a bot. I tried alternate rows fem different skeins but that didn’t really work and there was a bulky side seam which made the knitting twist. We shall see how it washes out! 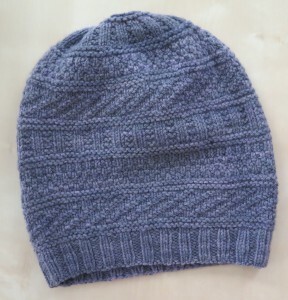 The yarn is so soft and light , this is knitted in the round as well (I hate purling). This is an expensive yarn but there is a lot in a skein, this is just under 3 skeins so far and working on a skein for each arm I think it will have come out of about 5 skeins, I might just break into the sixth. 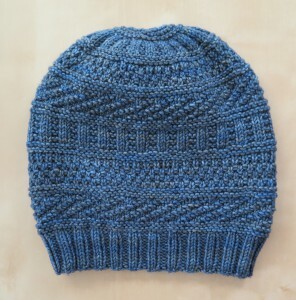 Now here’s a thing, a gauge thing, I found a great beanie hat, dustland by Stephen West and have knit it 3 times so far. Its a great slouchy beanie and for once I have found a hat that actually looks good on my head. Now here’s the thing, put them all together and you can see a huge difference. 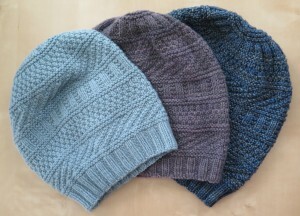 They are all allegedly worsted, they were all knitted on 4.5mm needles.They are all the same size on the pattern They have all been washed and blocked. My tension would be consistent but look at the difference in bulk and size. The Swan’s Island has the best drape and fall for a slouchy, the Madelinetosh the bulkiest and little drape in the Quince and Co. This is not a criticism of the yarns but an observation of the difference in how they knit up. Just one of those ponderings in my head! This time out has given time for thought and reflection on many things including the events of the past week, with all the talk of the Middle East andand air strikes on the agenda in the news I remember the alleged ‘war to end all wars’, WWI. 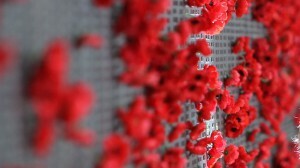 No longer within living memory of those that served, just as WWII will be soon. I look after some old Diggers and their stories are amazing and vivid as if it had happened yesterday, but there is nearly always this sadness as they recall their stories something if you ask them they often find difficult to express. There are many accounts of the the world wars and as we come to the 100 year anniversary of WWI the war poets are there echoing over the last century. Here are three to start with: Owen, Brooke and Sassoon.